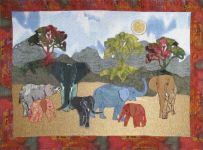 In this paper pattern there are five elephants in graduated sizes, two camels, a lion, tiger, giraffe, monkey, dog and a horse all decked out in circus costumes to be embellished with fancy machine stitches. The costumes are separate drawings. There is even a piece of gold lamé for the stars! 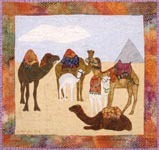 The size of the quilt in the photo is 40" x 56" The technique is fused applique with satin stitching and the quilting is done on the home sewing machine with straight stitching and a darning foot. 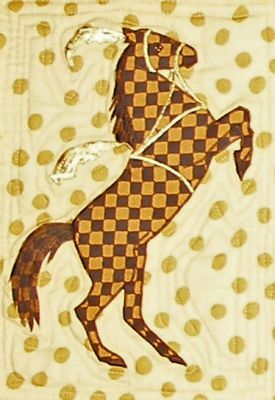 The plumes are gold thread, satin stitched. 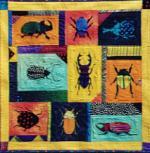 The stars are tricot backed (nylon knit backing) fused to the background fabric. 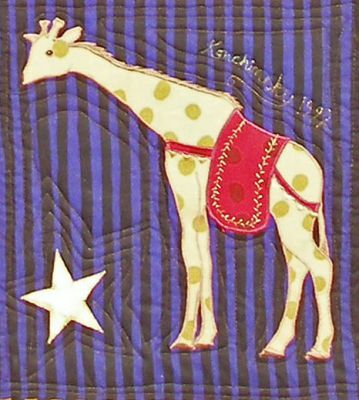 The giraffe's "clothes" is a separate fabric fused on top of the giraffe with decorate machine stitching. My signature is straight stitching with a darning foot. Imagine the needle is a pen and draw cursive letters.